We all know the banking system is broken. It’s easy to become pessimistic in the face of corporate and political corruption, but the system can be changed. We’ve done it before, and we can do it again. One pathway to genuine reform is “public banking”: the establishment of banks that are owned at operated by the government, and which serve people and small businesses directly. Here’s why public banking should be included in the agenda for deep and genuine financial reform. There’s a working model for state banking. The Bank of North Dakota has established relationships with all 94 of the state’s community banks and has helped increase their lending ability in a targeted way that supports economic growth. Local banking is desirable for many reasons, including the lenders’ familiarity with their community. (For an idealized version, think of Jimmy Stewart in It’s a Wonderful Life.) The presence of thriving local banks also helps fight the over-centralization of the banking system. 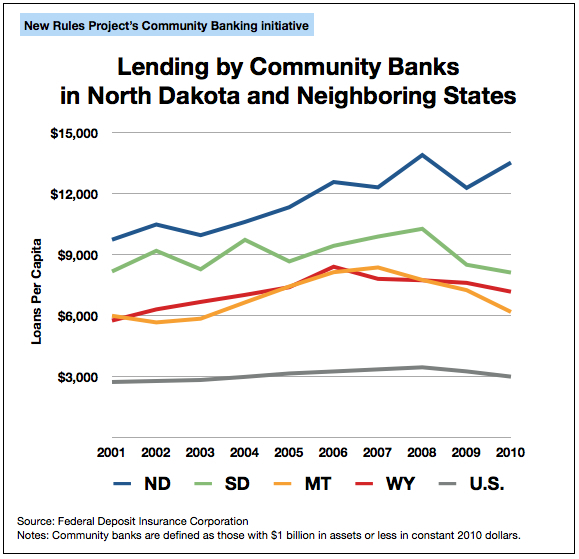 In North Dakota, community banking has also meant community lending. A meaningful economic recovery can’t take place until banks stop exploiting low-interest Federal Reserve loans and start lending responsibly, with well-underwritten loans to both consumers and the small-to-medium sized businesses that are the engines of economic growth. A joint paper from the Service Employees International Union and the Center for State Innovation called “Building State Development Banks” summarizes the argument for exporting North Dakota’s model to other states. There are many kinds of public banks. State banks aren’t the only public banking model worth exploring. The Public Banking Institute is also promoting the concept of county banks. Proposals for a “National Infrastructure Reinvestment Bank” have been put forward in Washington, from President Obama and others, since 2007. These proposals have merit, but have tended to follow the Federal Deposit Insurance Corporation model for housing loans. These infrastructure proposals would need firm safeguards to ensure that private banks don’t exploit them. Or, alternatively, they could provide loans directly, since an infrastructure lending program is urgently needed and major Wall Street institutions have not proven to be trustworthy stewards of public funds like these. “Public option” banks could help rein in runaway greed. These public banking proposals rely on a public/private partnership. Should public banks be established which directly compete with private institutions on a full-service basis? There may be merit in the idea of a “public option” bank which is available to people who feel they’re being misused or ill-served by the private banking system. If private banks are sure they can do a better job than the government can, this would be their opportunity to prove it to the nation. If they’re mistreating or overcharging their customers, this would create competition that could curb their excesses. Public banking can help strengthen cooperative banks, credit unions, and other nonprofit institutions. Public banks would provide another avenue for strengthening and expanding the non-profit banking system of cooperatives and credit unions, too. Public banking, together with other state and national initiatives, can be directed toward increasing these institutions’ role in the financial sector. We’re already in the “public banking” business. Now we need to get it right. Our country already has a public bank – of sorts – in the Federal Reserve. The Fed was created by Congress and derives its power from the people. But the Fed is enmeshed with private banking interests, so it tends to serve them at the public’s expense – and is egregiously mismanaged, too. We need a sound monetary and financial system. Central banks like the Fed stabilize the economy and ensure the soundness of currency. Other government banking initiatives include Fannie Mae and Freddie Mac for housing; the Federal Deposit Insurance Corporation (FDIC), which insures most bank deposits; and Sallie Mae for student loans. Despite the privatized abuses in some bank-related government programs, the services they provide are valuable and remain popular among voters. We urgently need to reform the Fed. (William Greider lays out some of those reforms here). We also need to protect other government banking program from private-sector greed and abuse. We need public banking – but we need to do it right. Public banks are no more “socialistic” than schools, police, fire departments, or the military. People have been trained to believe that anything publicly-owned is “socialistic.” Yet they don’t feel that way about police forces, the military, the water utility, public schools, or even Medicare. Public banking’s no more “socialistic” than these institutions. And public ownership’s every bit as justified in banking as it is in any of these ventures. Money is a public utility, created and maintained for the common good. Come to think of it, the Federal Reserve is one more example of “socialism for the rich, ‘free enterprise’ for you and me.” That needs to change. Public banks would not form a cartel. There’s no reason to believe that public banks would collude against the public interest. States compete with one another all the time. The real abuses in our financial system have occurred when public institutions like Fannie and Freddie or Sallie Mae were privatized, not in the days when they were public. If you want to see a real cartel in action, check out the way private banks colluded with one another on the LIBOR scandal. Public banking could reduce corruption. People sometimes express the fear that public officials would be corrupted in their management of public banks. They should take another look at Wall Street’s rap sheet: Investor fraud. Stock fraud. Perjury. Forgery. And that all-time favorite: Laundering money for the drug cartels that have murdered tens of thousands, sometimes by chopping their heads off. A public banking system which lent funds to private banks would also have investigative abilities that could help reduce epidemic of corruption in our banking system. The politics depends on us. Wall Street interests will oppose public banking, of course, and their lobby is overwhelmingly powerful. But banking lobbies have been defeated before. Let’s hope it doesn’t take another crisis – or worse – to create the political will to fight them. Fundamentally, this isn’t a complicated idea. It boils down to a very simple principle: We control our currency, and for too long we’ve ceded that control to corruptible private parties. Private-sector bankers should run banks, not the economy. Public banking can help to reinvigorate economic growth while restoring balance to our financial system.